Cpl. Che’ Atkinson changed that. Atkinson rented the woman and her child a hotel room and brought them food and drinks, an act of kindness that was covertly documented by one of Atkinson’s superiors and shared by thousands on Facebook. As of Monday afternoon, the Prince George’s County Police Department’s post had garnered more than 14,000 likes and nearly 3,500 shares since it was written on Aug. 28. Atkinson first saw the homeless woman, who was not identified, on Wednesday morning, sitting in the lobby of the District I station in Hyattsville. She had been staying at a homeless shelter, but had to leave for an unidentified reason, according to WUSA9. Atkinson tried getting a distant relative to pick the pair up and take them in. The relative initially agreed but, on Thursday morning, Atkinson found the mother and daughter still stuck in the lobby. The relative wouldn’t be able to come for at least another day – and it had already been two days since the woman and her daughter had eaten. 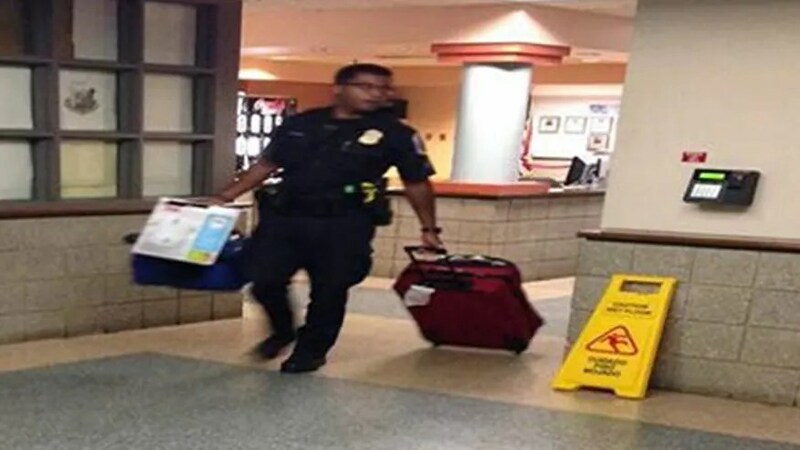 While Atkinson got the pair to a hotel, his sergeant slyly took photos to document the generous gesture. After a night at the hotel, the mother and daughter were able to finally meet up with relatives. The human heart is capable of so much kindness. Nice to know the reputation of the police was enhanced by this act and that the mother and child were safe. Yes! We just need to look for it haha.